My #camping book is published! I’m so excited right now I could run down the street screaming. But I won’t. Because that’s a good way to get arrested by the 5 O. I may have jumped up and down on the bed for a while, scaring the heck out of the cat. Can’t even express what it’s like to get the mail, open the box, and see your book in print. Words … I can’t even. You voted for your favorite cover art and we have a winner – The cover that had the view of looking out of a tent onto a grassy field! However, it only won by one vote. That was close. So I gathered up the comments you left about what you liked and didn’t like about both top vote getting covers and took that to the designer, Kit Foster. Using the winning cover as a base, we made a few subtle adjustments that incorporated elements from the second, the one that had all the photos on it and the more ornate font. The most notable change is the font used, we went with the font from the runner up. Other changes are more subtle. Like the bottom of the martini glass fading away rather than being seen through the title area. The back of the book will have one or three of the photos from the runner up cover design along with the blurb of what the book is about. So thank you for voting(Those who were Backers and were able to vote) and know we are getting very close to a publish date! As in 2 weeks close! Ericka, the interior book designer, said that if I thought chapter 3 was my favorite, wait until I looked at chapter 4. She was right! I can’t even express what a dream come true this is for me. The book is looking even better than I pictured in my mind and I owe it to you, my backers, and to the wonderful and talented team working on this book. I’m so excited for this book to be finished and available. When this sucker is done and we have the launch party, it’s going to be awesome and ugly. Please be awesome and ugly with me when the time comes, ok? 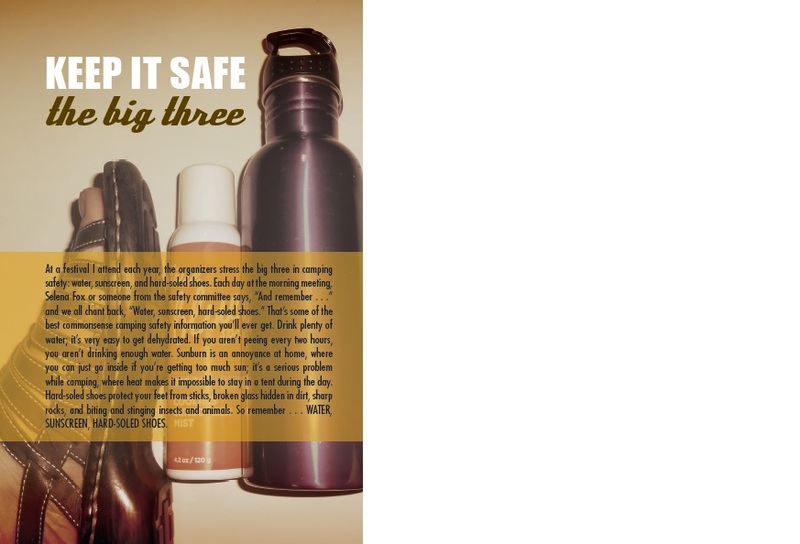 Protected: YOU pick the cover of my glamping book! Still pushing, pushing, pushing to get get the book design finished. Ericka is finishing up Chapter three and I think it is my favorite chapter! 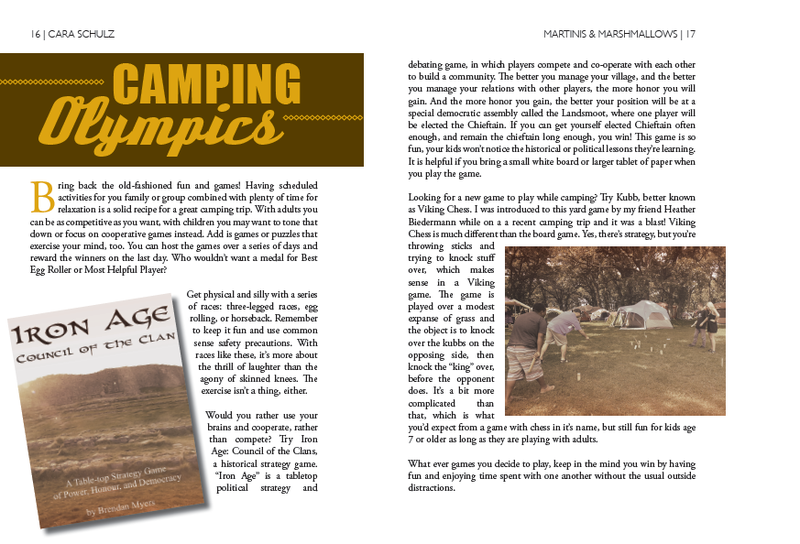 Each chapter in the book is set up to showcase a specific style and camping group. Chapter one is very romantic, the most girlie look in the book, and it’s geared for a couple not quite ready for a full camping experience. Chapter two is very modern and focuses on designing around a single bold color. The gear is perfect for a single person camping alone or with a group. Chapter four shows how to design around a theme, in this case a decade, but it could as easily be a favorite tv show or a hobby. The chapter shows a family camping together and the tips and suggestions are family friendly. But chapter three? Oh chapter three, you are lovely. The chapter shows a couple camping together but the look is more tailored, with a hint of safari. It’s a perfect mix of luxury and melding in with your surroundings. Like the rest of the book, it’s also very practical. Here’s a sneak peek at one of the pages from chapter three. The next update should be three possible cover art designs which only my Kickstarter backers are able to vote one. Which ever one they pick is the one that will be the cover for my book. After all, they’re the ones who made this book possible. In the summer of 2013 I took a dream motorcycle ride across the country. This is a journal that I kept while making that trip. Review by Painter Dave: Written by a close friend of President Teddy Roosevelt, this book gives you a look at the real man, the way he thought, the love of the outdoors, and the love of people who lived in the outdoors. If you appreciate the Wilderness in American, the Parks and mountains, then you will enjoy a book about the man who helped make them possible. Kindle has made many of these books about Roosevelt available and this is one of the best. See Yellowstone before it became what it is today, and enjoy it with the President. One of the things I try to stress to people when we talk about making camping more comfortable and attractive is that you don’t have to spend a ton of money. Just look around your home and you’ll find beautiful, well made camping gear. One example I’d like to show show is this shower caddy. Most of the year it can hang in my shower holding my shampoo and conditioner at the ready. 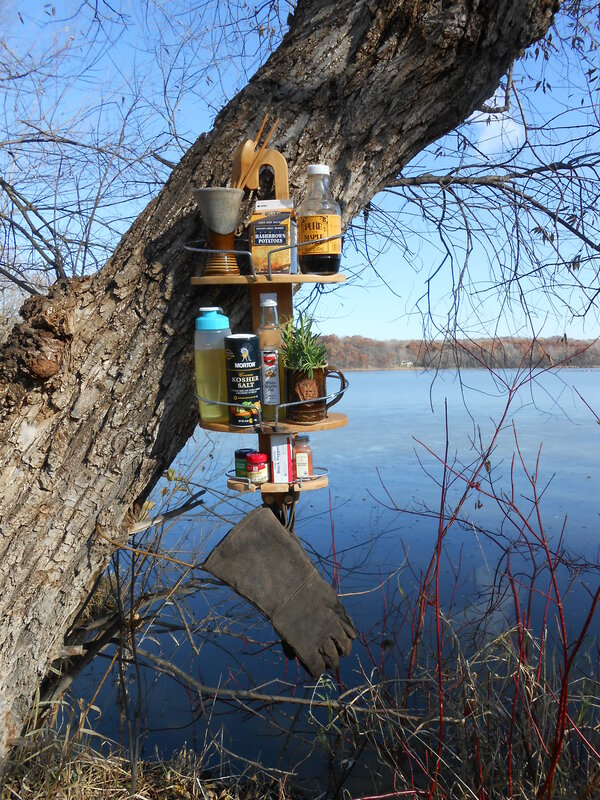 But it lives an adventurous, secret life as a camping kitchen organizer with the help of a handy tree and a hammer and nail. 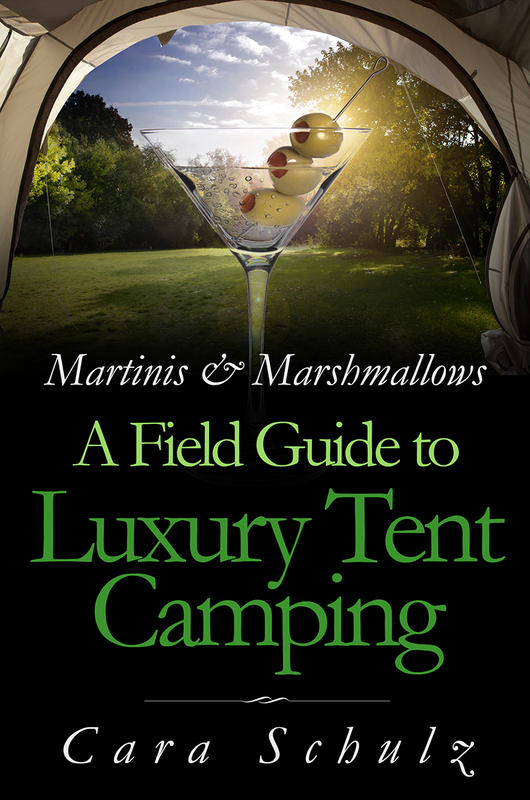 This is just one of the tips I’m including in my book Martinis & Marshmallows: A Field Guide to Luxury Camping, coming out next month.